United Yacht Sales New Jersey would love to guide you through a personal showing of this 48' Sea Ray 480 Sundancer 2008. This yacht for sale is located in Vero Beach, Florida and priced at $386,000. For a showing please contact us by filling out the form on this page and we will get back to you shortly! 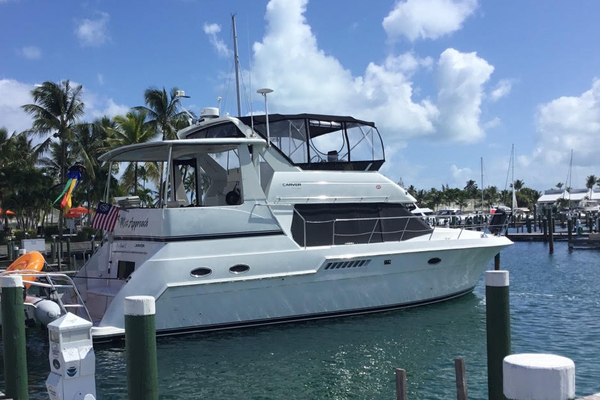 This beautifully maintained 480 Sundancer features two private staterooms with two private heads. Cherrywood cabinetry throughout and Corian countertop provide a rich and elegant feel. The Master Stateroom is forward featuring an En-Suite head with a separate shower stall. The Guest Stateroom is Aft with side by side twin berths and an En-Suite head. The large Salon features a L-Shaped Ultra-Leather settee with a high/low cherry dining table. The spacious fully equipped Galley features a full-size refrigerator with freezer, convection microwave, two burner electric cook-top and lots of storage cabinets. On deck is a large Cockpit protected by a hardtop and aft enclosures with a dedicated Marine Air Conditioner. Abundant seating and a unique helm seat module that can be turned 90° for socializing at the dock. The Cockpit also features a wet bar with sink and refrigerator and large countertop area. Powered by Twin 540HP Cummins Diesels with LOW Hours. Cruise 25 knots in air-conditioned comfort. Electric winch and roller system for loading a tender is removable and can be stowed away when not in use. “FIRST CAST” IS IN EXCELLENT CONDITION!